100% cotton rust-colored tee with Chris Stapleton bear print. I bought two shirts and both were shipped quickly. I was impressed by the quality of the material. Both are so soft! I love Chris Stapleton for being the type of man he is, and nowi can show my support for him and for his music. I love the bear t-shirt! It is very comfy and made well. Please make more of The Bear T!! Only small and medium are available right now. 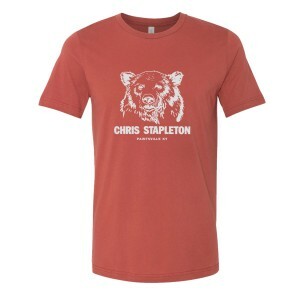 I'm wanting to order one for all my family for Christmas since we are huge Stapleton fans and we are from Paintsville!! Ordered my husband one and he loves it!